Past Sunday we had the 5th WebiTalks meetup. 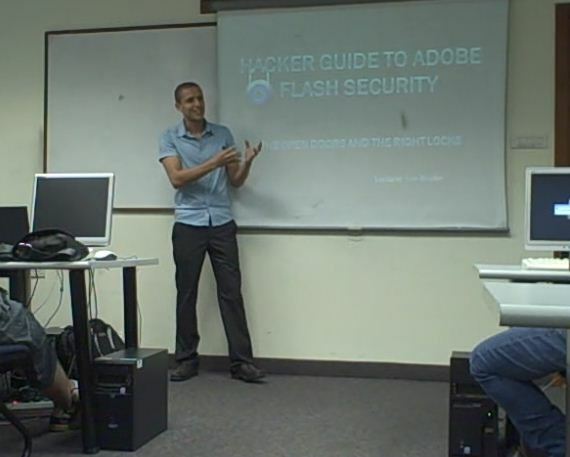 This time about Security in Flash Applications and Games. It was very interesting to see that at the same time we announced the meetup, two interesting debates about tweaking, changing and winning online Flash based games using various sniffing techniques started at Flashoo, the Israeli Flash community forums (Security in Flash games tests, Memory access tweaking). To summarize the meetup, it was a fun & pleasant meetup with 30 attendees followed by a good discussion and great responses for more meetups of that kind. Lior Bruder – who gave the presentation did a great job, outlining most of the basic mistakes developers do and don’t do, leaving their apps and games opened for intruders. I got a chance to meet new members of WebiTalks. Had a nice conversation about general security in web applications/games. Met Elad Cohen, and his new backgammon platform: GammonShark, an online backgammon system. Elad has an interesting approach on developing the game and making it profitable, first by providing APIs and many features that enable people to host the game on their servers, hold their own backgammon rooms, create affiliates and make money. Elad suggested a new meetup Idea about hacking online games – let us know if you like it by voting on the page. Looking for the video? Join WebiTalks and we’ll send you an email when the site is up!